My cat Avery’s obsessions seem to come and go like the wind. No matter how long he seems to be loving a specific cat toy, I’ve gotten used to the fact that abandoning that toy after some arbitrary period of time is just around the corner. As a result, I’m always on the look-out for new products that will hold his interest. My line of thinking is that if I can get a number of cat toys in the line up that he absolutely loves to play with, I can hopefully cycle through them endlessly so that he doesn’t ever get bored again. 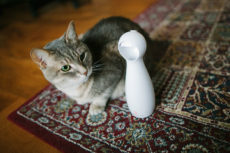 Thus far, probably the only store-bought cat toys I’ve ever managed to get Avery to play with by himself are these Spot Ethical Pet Cat Springs. 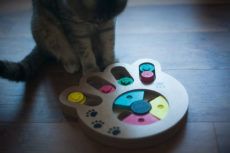 These toys, however simple they may appear, managed to hold my kitty’s interest for a solid year or so. 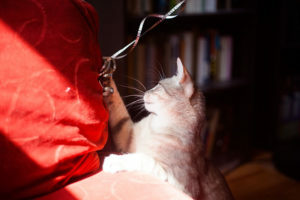 Of course, my cat being fickle as ever a cat was, he’s currently off them, and instead plays only with pancake versions of DIY aluminum balls by himself – though not for quite as long as he used to play with these cat springs. It’s a damned shame, but I’m still holding out that one day, his fascination with these springs will return, and he’ll go through yet another year-long obsession with the lovely things. One can only hope! I don’t even know how many packs of the Spot Cat Springs I’ve bought over the year or so he was obsessed with them. 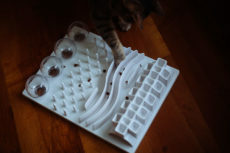 Like the Catit Design Senses Food Maze, these springs are some of the only cat products I’ve bought for my own cat and loved so much that I went out and bought some for other cats I know as well. They were that great for Avery in their hay day. I have video footage of him scrambling through hallways after these springs, jumping under furniture, going wherever he could to play a glorified version of soccer with them. 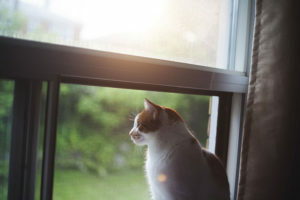 He’d prefer playing where there was no carpeting – either on laminate or hardwood floors – but wouldn’t object to playing on carpeting, too, though never for as long or intense a playtime. I’d play with him with them, too: throwing them into cardboard boxes so he’d leap in, or sliding them down a hall so he’d go running. There was no short of exercise he was getting, and even though it was still annoying to get him started playing (he is quite a lazy cat after all) and he would never play for too long by himself – the Ethical Pet Cat Springs were still an easy way to engage him and keep his time occupied, with or without human interaction. One day, maybe when we have more room and long hallways again, I’ll take these guys out of the “cat drawer” and give them another go with him. Until our environment changes, however, I doubt he’ll be re-interested in them. Just the way he is! But anyway, you’re likely here for a more substantial review, so let’s go over some typical review-like things. I was initially worried that the springs would break easily, or they’d snap in half and Avery would end up choking on them. But they’re flexible enough, and so with some pretty repetitive use I discovered I had nothing to worry about. They do bend at times, but it’s pretty rare, and when they do bend, they rarely immediately snap. You can see the bend and throw out the “damaged” spring before the toy snaps. No qualms there. 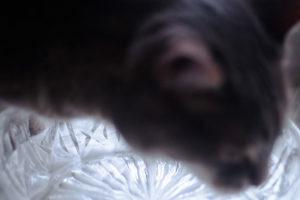 Do they hold a kitty’s attention and are they great for play time? Yes. 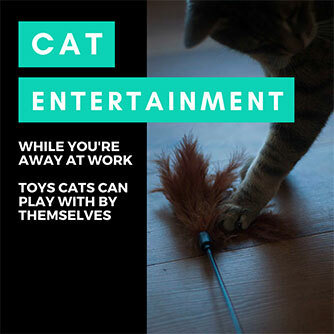 Especially if you vary things up by altering how you play with a cat with them. 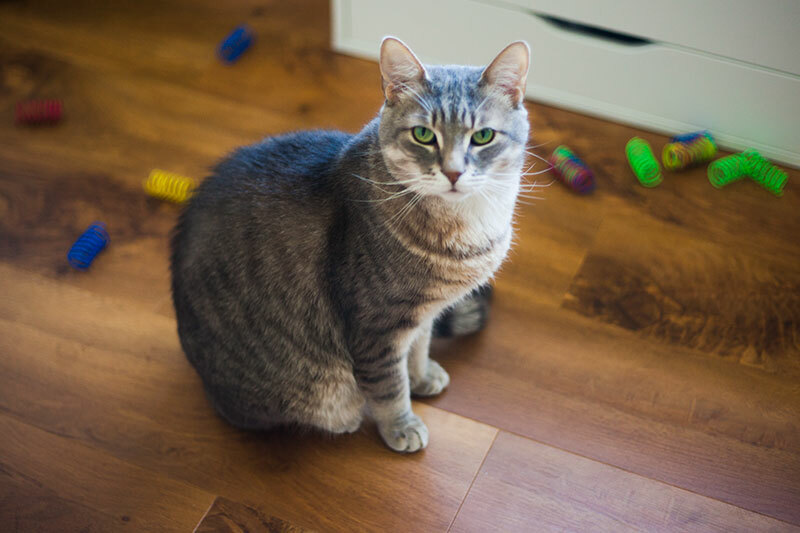 Throwing them into cardboard boxes or down long hallways are good options – cats will go crazy for the way they bounce, as springs like these are much more unpredictable than nearly any ball would bounce. I think that’s what helps them to be a lot more interesting than balls (which my Avery has never played with). 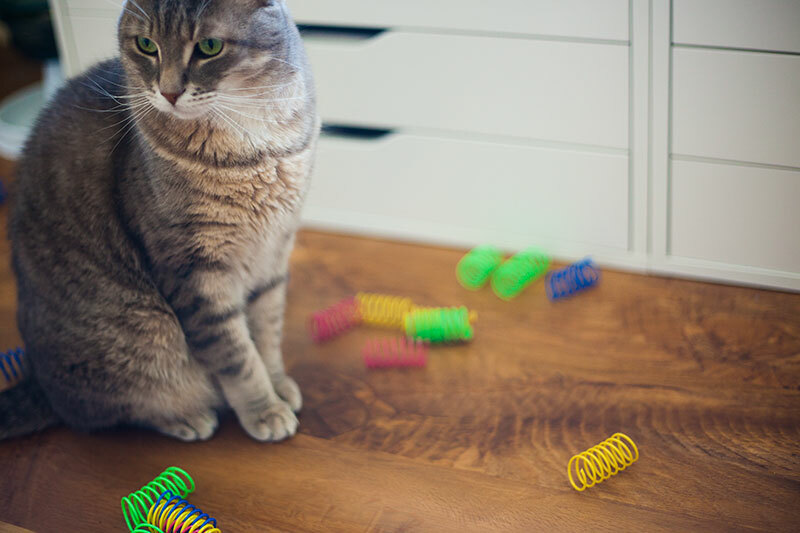 When you’re taking an active part in play time, I’d recommend throwing the springs in a way that’ll make them bounce as much as possible, as that seems to have gotten my cat’s attention the most. 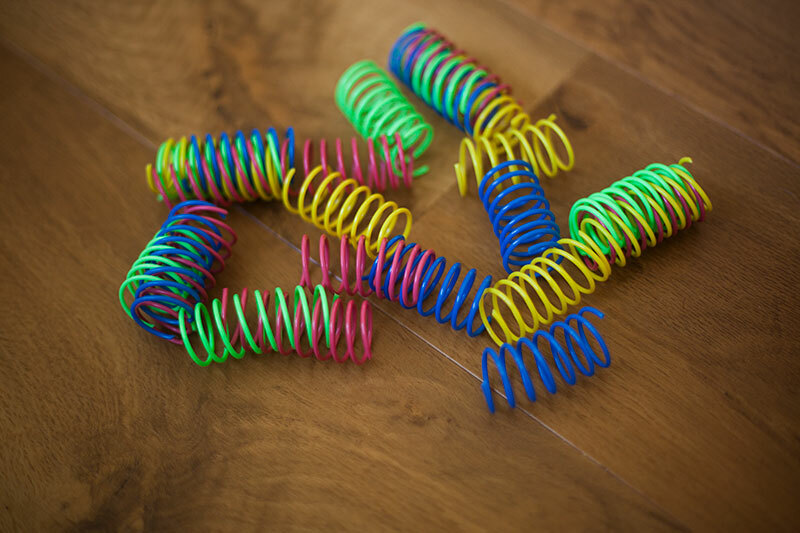 Either throw them hard onto the ground so they bounce up, or throw them against a wall that they’ll then bounce off of – basically try to keep things interesting by being a little unpredictable about how you throw, which then makes the springs unpredictable insofar as where these fellas will end up. If you’re happy with kitty playing all over the sofa, give them a throw onto there every once in a while, too. 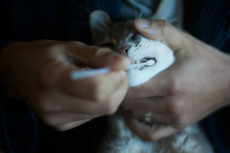 Test out throwing them in as many different ways and spots as you can, then vary up between your cat’s favourites. 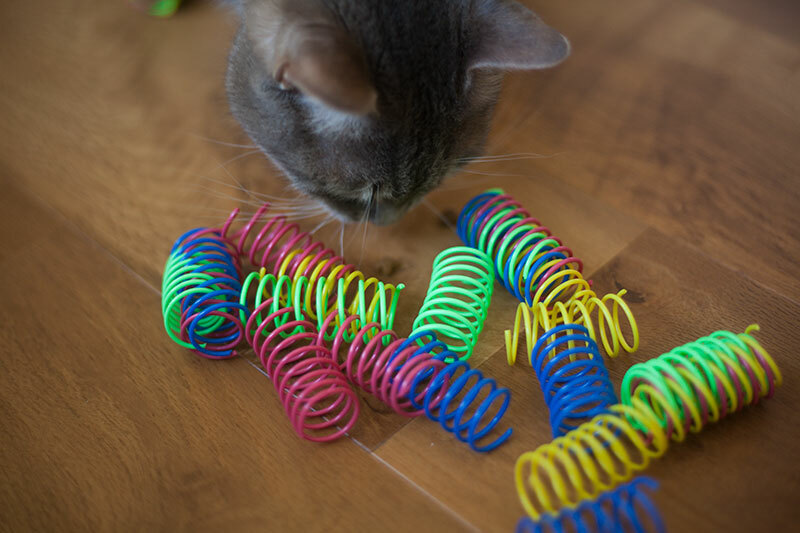 The springs also roll in quite a nice way to look at once they’re done bouncing, so maybe that’s also part of what catches cats’ eyes and holds their attention. 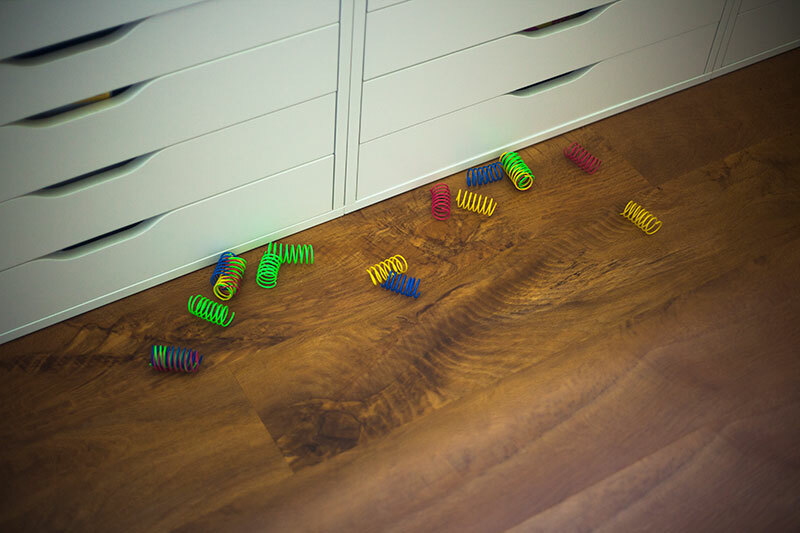 Avery also really liked picking these out from under doors – of course I’d often be on the other side trying to keep them near enough to the door that he could reach them, but still was a good way to keep him entertained. I used to try putting them inside DIY cat feeder toys, but he didn’t take to trying to pull them out for entertainment. Again, my cat’s fussy, but who knows, your cat may like pulling them out of cardboard boxes with holes cut into them. Only way to know is to try! 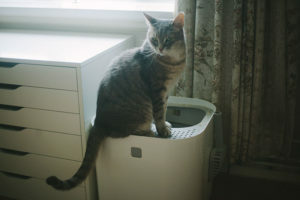 Is there a downside to the Spot Ethical Pet Cat Springs? Sometimes you don’t realize they’re on the floor and step on them, and yup – outch. Not quite Lego pain, but not a nice surprise, either. This is also how most of the damage to them happens – causing them to need to be thrown out. So I’ve learned to tuck them into spots like corners and alongside the walls where my feet won’t end up crushing them. A second downside – they go everywhere obviously. 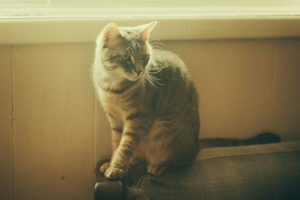 They’re very unpredictable in terms of where your cat will end up chasing them, so if you have something breakable in the room, don’t use that room or move the breakable items out, ’cause you can’t blame kitty if he/she ends up breaking something in his/her quest to go after the cat springs. 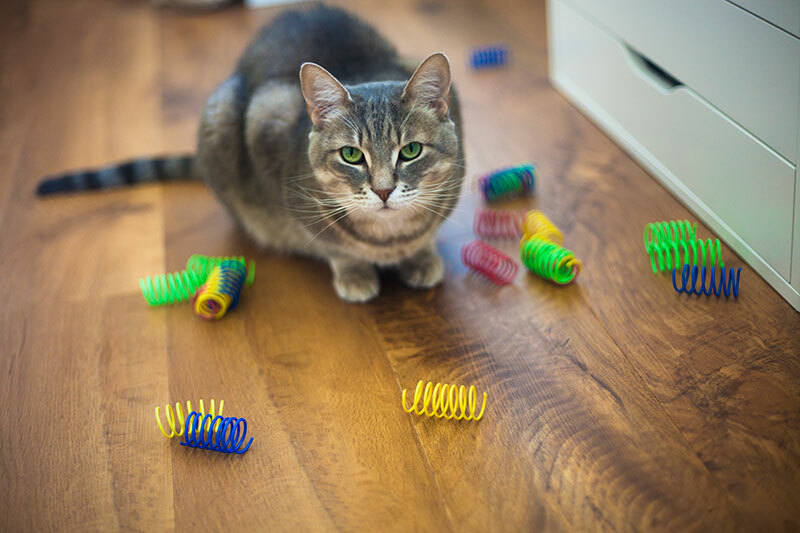 Best area to use these toys is where there’s nothing that your cat can ram into that’ll break – an empty hallway or a hallway filled with cardboard boxes for kitty’s amusement for instance, which will do the trick quite well. Are these toys long-lasting? Hell yes, but they’re so cheap, I bought a slew as backups anyway. 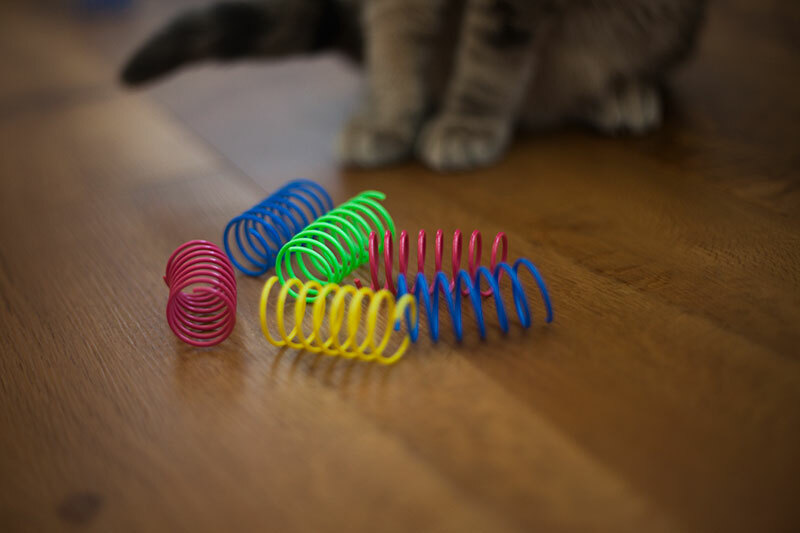 You’re more likely to lose the springs than to break them, and yes, of course they’re easy to lose considering they’re pretty small as far as cat toys go. Under the bed, under couches, under tables, and in just really strange places. My guess is if your cat ends up fancying them, you’ll be buying more of them in no time just like I was. They come in a couple of sizes. I tried the wide ones first, and Avery loved them, but my brother grabbed the thin ones after I recommended them to him and gave me some of those to try. 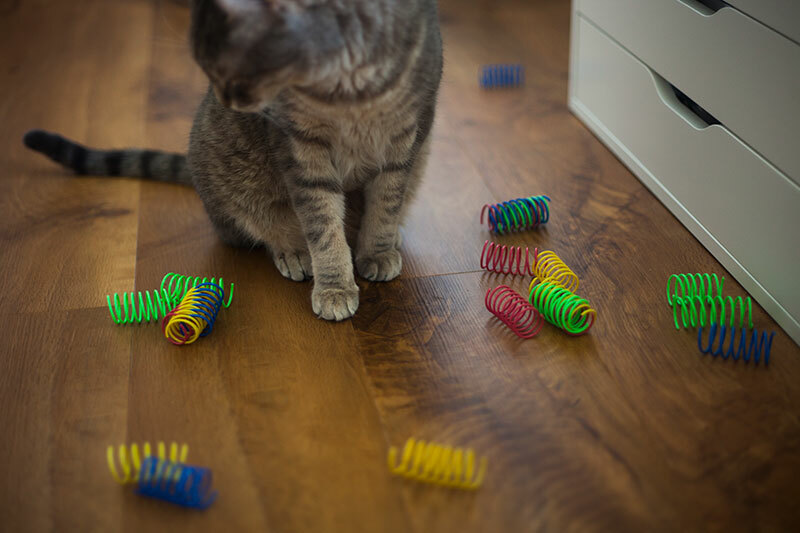 Avery played with them happily while he was still playing with springs at all, so I don’t think cats will really care for one size over the other, though if you’re into varying up your toys, a pack of each should do the trick nicely. Not much else to say besides the fact that I’ve got nothing but love for this affordable, worth-while toy. I honestly wish Avery was still into Spot’s Ethical Pet Cat Springs to this day, but I’m not holding my breath to see how long it takes before his liking for them re-ignites. (Edit 01/28/19: Avery’s back into these now in full force and has been playing with them more and more in the past few months we’ve been in a house rather than a studio flat. His favourite trick? Taking one of these down the stairs at a time and batting them across the main floor hallway. So glad he re-approves with the additional space). Avery’s an odd duck when it comes to toys and playtime and I expect nothing more than indifference from every toy I introduce him to. 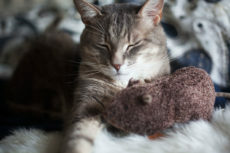 If things work out, I’m ecstatic, but can’t rely on cat toys to stay interesting to him for all that long. Hence why I’m always on the lookout for more to test. A year in my cat’s favour is one hell of a long time for any toy. 2-3 months is usually all I get, half a year at best if it’s a real hit. The fact that these lasted so long in his favour was nothing short of a miracle. Of course, we can’t ever choose what our cats do and don’t love, but if I could choose, it’d hands down be for these to make a comeback. Would these be suitable for a cat who likes to chew her toys? Mine had a very specific kind of toy mouse that she loved to play with, but she eventually destroyed all of them that we had bought (and we accidentally threw away the last one, her ultimate favourite, I still feel guilty about it 🙁 ) and I have been (unsuccessfully) looking for a replacement ever since, since no pet stores in my country seem to stock THE mouse any more and nothing else excites her. These look like they might interest her, but I am a bit worried she might break and ingest them. There’s only one way to find out for sure, try them, but monitor her while she’s with them. I don’t *think* these are the types of toys a cat would be fond of chewing on, my Avery certainly doesn’t chew on them (though he picks them up with his mouth every once in a while), and these springs even work for my brother’s cat Beau who has pica and likes to eat everything (including the handles on pots! ), but I don’t want to say outright that she will not chew, as you never know for sure until you try. Either way, they are not easy to snap and they show signs of wear before they actually break, so if you’re monitoring her for the first few months while leaving them out, I daresay you will for sure catch any wear (the plastic shows when it’s been bent) and throw out the semi-broken spring before it gets to the point where it snaps. 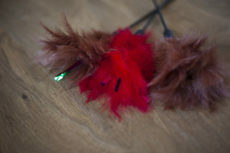 Good luck, because I know how hard it can be with cat toys for kitties that are picky about their toys! And let me know how it goes if you do buy them! Artesia love these things! Hallway is the best place to play, cause she loses her mind ! Incredible feats of skill and destruction…. Thank you for stopping by Binky! 🙂 And would love to see what kind of a mousie you’re a fan of! 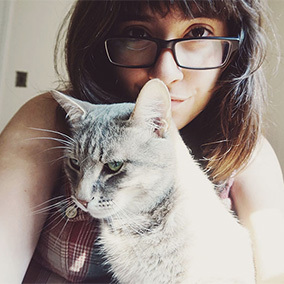 🙂 – stopping by your blog now. Literally have about 150 of these springs around the apartment. We may have gone overboard…. No such thing! If it works, why not? You’re so lucky Beau still plays with them.